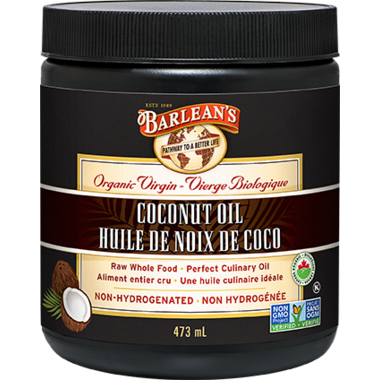 Savor the tropical aroma and light, sweet-nutty flavor of Barlean's high quality Virgin Organic Coconut Oil. As delicious as it is versatile, it is great for baking and stir-frying and for curries or other dishes that benefit from a slight coconut flavor. It is also effective as a skin moisturizer, make-up remover and hair conditioner. This oil comes exclusively from certified-organic plantations in the Philippines where coconut palms grow naturally without pesticides. Coconut oil does not contain any trans fat (the unhealthy kind). It is semi-solid at room temperature and liquid when warm. Recommend Dosage: 1 Tbs - May be used Straight in cooking, baking or frying - as a spread on toast or muffins and as a massage/body oil or hair tonic. Organic, Vegan, Non-GMO, Kosher, Keep out of reach of Children. I used to be able to be able to purchase this product at our local health food store but apparently is no longer available in the retail marketplace. Thankfully well.ca was offering and so I purchased 1 unit of this product. the reason I like this product is firstly is the beautiful aroma and is almost aromatherapeautic for me. Secondly it is a great massage oil and is not greasy and does not leave an oil film on your body. Too precious actually to be put into any situation where the product would be mixed into etc. Will continue to purchase this product as needed. A winner for me.